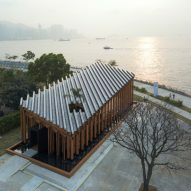 New Office Works has completed a pavilion with a sloped roof and slender columns, alongside the M+ Pavilion within Hong Kong's West Kowloon cultural district. Named Growing Up, the pavilion offers a covered seating area in the rapidly developing area. 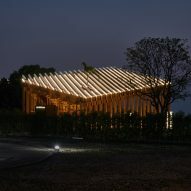 The project's name derives from the idea that the city is cultivating its culture, and is also a reference to the future of the newly-planted greenery of neighbouring Nursery Park. Built to host markets, small concerts and dance performances, its angular but modest form aims to present different narratives through each elevation. The north and south elevations are transparent as they frame the view from the park through to the harbour, while the east and west facades are rhythmically sliced by the columns. New Office Works designed the pavilion to have a distinct profile that rises from the human scale of the park to relate to the larger scale of the harbour. Inside, the stepped seating area contrasts against the verticality of the structure. 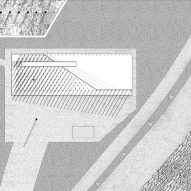 Like the exterior topography, it offers a viewing platform to the harbour and surrounding neighbourhood. Evelyn Ting, who co-founded New Office Works in 2014 with Paul Tse, designed the pavilion to reference familiar local features like the narrow alleys, scaffolding and steps. "The design process was really an exercise in close observation of things around us, and how to lend significance to various elements that comprise the city," she said. New Office Works designed the pavilion to highlight rain as a constant of the city through both its construction and aesthetic. 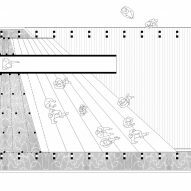 It is meant to be a place where visitors can interact with the "performative quality" of the water. The roof structure enables a natural draining system designed to adapt to Hong Kong's wetter seasons. Funnelling through subtly conic, curved polycarbonate panels and tubes, rainwater is shed – similar to the system of traditional Chinese roof tiles. 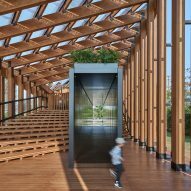 Surrounding the pavilion, an open stepped landscape is designed to invite opportunities for socialising and activities. 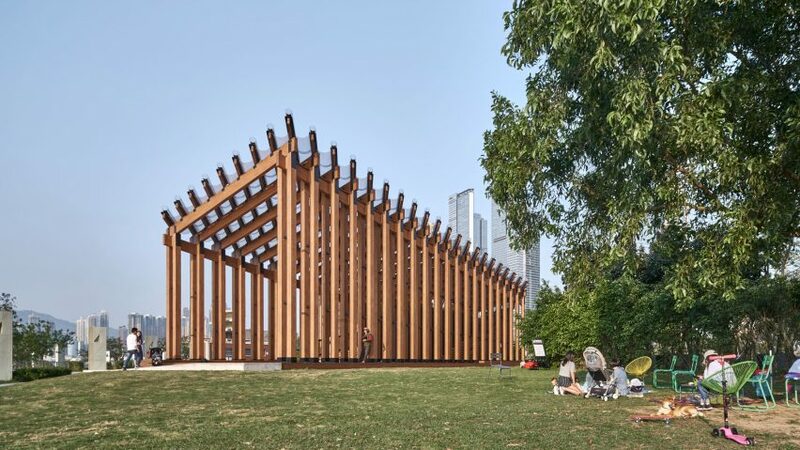 Located in the arts and culture district of West Kowloon, the project was the winner of the inaugural Hong Kong Young Architects & Designers competition to design a temporary pavilion on the prominent waterfront. 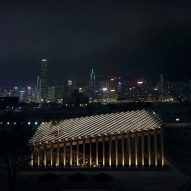 It now forms part of the West Kowloon district masterplanned by Foster + Partners, which will contain 17 new cultural venues including The M+ Pavilion, which opened in 2016 ahead of the Herzog & de Meuron-designed M+ Museum set to open in 2020. The area also contains a theatre complex by UNStudio, new station and aluminium ribbed opera house. Photography is by Xu Liang Leon unless stated otherwise.